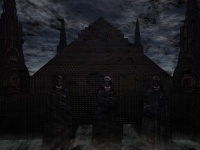 The Shadow Academy is the primary training facility for new members of the Dark Jedi Brotherhood. At the Shadow Academy, new apprentices are trained by more powerful Force Users or mentors in as they begin their journey and new lives in the Brotherhood. The Academy also serves as an enormous archive of information for the Brotherhood, housing various libraries, console rooms, and the Dark Vault, the latter of which the Brotherhood's valuable artifacts and treasures are sealed off and studied in. "There are dark places in the galaxy where few tread. Ancient centers of learning, of knowledge." The idea of an academy to gather and train Force-sensitive individuals is certainly not a new one, but rather a practice that has been adopted by both light and dark side followers. On top of this, the name "Shadow Academy" is hardly an original one in the galaxy. The Shadow Academy of the Dark Jedi Brotherhood was founded in 11 ABY by Grand Master Jedgar Octavius Paladin, apprentice to Kane Vader. Paladin understood the threat of the growing New Jedi Order, and as Grand Master he began to aggressively add members to the roster of the Brotherhood. In order to find stronger and potential Force-users, he began a rigorous training programme to guide members through their first initial steps. Whether a student made it through their initial training or not was decided by the first Headmaster, Stefan Ronin. "You are here because we have called you, not because you think you belong here." Based on the planet Eos in the Aurora System, the Shadow Academy continued to grow and turn out new members to the Dark Brotherhood and Emperor's Hammer under the reign of the Headmaster. During these years, students remained at the Academy until they reached the rank of Guardian, after which they would be assigned to a Clan. The Brotherhood was also strictly divided among the three Orders at this time, that the Academy offered unique courses for each Order, with the Test of Lore being the only shared course among the programs. As the Pre-Exodus years continued, the Shadow Academy saw itself grow exponentially due to the demands of increased membership and the loosening of order restrictions under the reign of J'lek Arcanon. New courses were created under the reign of Mejas Doto, Troutrooper, and Mage, and during the tenure of Acxodim Pyralis course graders called Eclectic Pedagogues were formed, and the Society of Envoys was placed under the command of the Shadow Academy. In 19 ABY, the Seven, including the then Headmaster Pyralis, announced their intentions to break ties with the Emperor’s Hammer with the Shadow Academy being caught in the middle. While there are no known reports of fighting within the halls of the Academy, it is known that the Seven took a large amount of texts and artifacts with them when they ran the blockade in the Palatir, later placed under the command of the Headmaster. The Brotherhood made its way to Antei and the Shadow Academy was relocated to the moon of Lyspair. Starting off as a small, prefabricated shelter, it was quickly expanded both in size and worth under the reign of Headmaster Kaiann. "I'm beginning to think this place is cursed." During the Sixth Great Jedi War, the halls of the Shadow Academy were turned into a battleground between those members infected by Okemi and those not. The structure was heavily damaged, with certain sections being destroyed completely. Under Headmaster Spears, reconstruction began almost immediately, but had not been completed by the time of the Seventh Great Jedi War. Anshar, who had been Headmaster for mere months, suddenly found himself fighting his brothers and sisters against the clone Jaac Cotelin. Though no fighting occurred on Lyspair, the scale of the war convinced Anshar to revamp the Academy's defenses, including the acquisition of a fleet, at the head of which was the Mnemosyne. For a time it seemed as if the Academy was safe, but shortly after the Rite of Supremacy, the Brotherhood found itself under attack by an unknown alien race. The Mnemosyne was destroyed during the initial attack, seemingly killing Anshar. Days later, however, Anshar reappeared to assist his Praetor, Dranik, with the Evacuation of Lyspair. As the clans battled above Antei, the Headmaster considered destroying the Shadow Academy, but instead left it intact as they fled the system indefinitely, taking only the most important texts and artifacts. "We are strangers to the galaxy. We teach strange things, the likes of which many in the galaxy can hardly fathom." Like the rest of the Dark Brotherhood's main forces, the Shadow Academy was in exile after its evacuation of Lyspair. Gifted with the Arcanum by Grand Master Sarin, Headmaster Anshar quickly established the flagship as a mobile Academy, frequently making short hyperspace jumps to avoid unwanted detection. For nearly two years, the Arcanum served the members of the Brotherhood in their studies, during which time Anshar returned to his native clan and a new Headmaster, Aabsdu, took over, continuing the expansion of studies set by his predecessors. Despite being homeless, the Academy continued to grow. During the Ninth Great Jedi War in 24 ABY, the aliens had begun to die out, and planets within the Antei system had been taken by Omancor Crask and his legion of Jedi. The Arcanum fought valiantly against the Jedi fleets, ultimately being destroyed in the process. It was only after the Reclamation of Antei that Aabsdu coordinated a retaking of Lyspair, and he and his fellow staff found the facilities either destroyed or in horrid disrepair. Great measures were taken to restore the facilities and the Dark Vault, and the Academy soon resettled at their former base. A year after resettlement, Aabsdu ordered a reformation of the Academy staff. He replaced the Eclectic Pedagogue with Professors and Docents, making it more efficient to run and grade classes. After overseeing much labor in the recovery of the Academy, Aabsdu resigned from the position of Headmaster. The vacant position was filled by his Praetor, Taigikori Aybara Dupar, who worked to continue the efforts as started by his predecessor. While the Academy was stable during the years following the return to Lyspair, it was not been without its conflicts. Most recently, a Jedi by the name of Liu Van Dae attempted to infiltrate the Dark Vault, only to be stopped by Taigikori and Grand Master Muz Ashen. Although Taigikori ended up losing his lower jaw and tongue during the duel against the Jedi, Liu Van Dae was presumably killed while attempting to escape Anteian space, then rediscovered on New Tython and confirmed dead in 35 ABY. After the Tenth Great Jedi War, Taigikori was appointed the new Justicar of the Brotherhood. His Praetor, Ronovi Tavisaen, was immediately selected to be his successor, becoming the first female Headmaster in the history of the Shadow Academy. Her short tenure, however, would be one of conflict and turmoil. During the Horizons crisis, Journeymen being initiated into the Brotherhood were stricken with a plague that cut off their connection to the Force while building their physical power. The illness spread throughout Lyspair, forcing the leaders of the Academy to shut down any and all access to its facilities. A quarantine partially failed, and while originally the Academy was thought to be the source of the plague, it was discovered that fallen Grand Master Archibald Zoraan had released the pathogen onto the Brotherhood as a bioweapon. While Ronovi was instrumental in preserving the Shadow Academy during the Horizons crisis, she was also responsible for nearly destroying it. Her erratic behavior and hoarding of holocrons following the incident resulted in her being unceremoniously removed as steward of the Academy. Her replacement, Solari, was an unorthodox choice, as he was a Jedi of the light side. Nevertheless, he carried out significant changes to the Academy during his two years as Headmaster, implementing the Shadow Academy Society as blueprinted by Taigikori and dedicating an entire hall to the progress of the Brotherhood's Journeymen. Following the Dark Crusade, it became quite clear that the Dark Brotherhood needed to help increase the survival rate of its membership. The then-Headmaster, Solari, appealed to Grandmaster Keibatsu that they make the Academy a place of knowledge for the greatest Elder, as well as the basest Initiate of the Brotherhood. This resulted in the formation of the Shadow Academy Society. Ranks were created to limit the levels of knowledge available to its members. This prevented the young, inexperienced students from dabbling in dangerous knowledge before they could properly understand the danger and complexity inherent. The existence of the society was made official in 32 ABY. The events of the Eleventh Jedi War would see the Grand Master Muz Ashen attempt to recreate the Rite of Obscuration. The first portion of the Rite saw the destruction of the planet Antei. Most of the information was thankfully recovered, and the Academy found itself wandering aboard the Dark Council’s mobile fleet. The fleet-bound Shadow Academy would continue until 35 ABY, when Grand Master Pravus made Arx known as the new seat of government for the Dark Brotherhood. Besides giving the Academy and its Society a new home, it also served as a home for Pravus’ New Order. Upon joining the Brotherhood of the Dark Jedi, Initiates are automatically enrolled in the Shadow Academy. All new members are assigned to a campus based upon their given Order: Sith, Jedi, Gray/Dark Jedi, Mercenary or Loyalist. Their first task is the studying of the Brotherhood's most basic rules, and the subsequent Test of Lore that follows. Upon completion of the Test of Lore, one gains elevation to Apprentice and is automatically assigned to a Clan or House. After graduation from the earliest courses of the Shadow Academy, a larger selection of courses becomes available to the new member, some of which are related to a specific order or skill. These courses are divided into departments and found on the left hand side of the main Shadow Academy page. Typically, the preferred course after completing the Test of Lore, would be the Dark Brotherhood Basics course. The Shadow Academy is the largest of all Dark Council offices in terms of staff size. The Headmaster (HM) is in charge of the entire Academy, overseeing day-to-day operations, managing resources, and serving as a resource to Brotherhood members, new and old alike. The Headmaster has final say in all Academy decisions, including the selection or removal of staff members and judicial matters within the Academy halls. Unless representing the Academy in the Dark Council, the Headmaster rarely leaves Lyspair. The Praetor to the Headmaster (P:HM) is the second in command of the Academy, assisting the Headmaster in his duties and serving as his most important advisor. He or she has sweeping administrative powers, second only to the Headmaster, and is in charge whenever the Headmaster is unavailable. While usually present on Lyspair, some Praetors have also held lower levels positions in their clans or houses. The Magistrate to the Headmaster (M:HM) is awarded to those who provide specialized services to the Academy for extended periods of time. Magistrates are usually hired to work on specific projects handed down by the Headmaster or Praetor, and are sometimes released once the project is completed, or given a new assignment. At times, Special Magistrates have been appointed by the Headmaster to help cover the duties of the upper management, but this is rare. Professors are the test graders for the seven different departments in the Shadow Academy. These professors are equal to the Magistrate on the command structure, since they are responsible for the maintaining of their respective departments, as well as creating new courses and various other projects. The main difference between a Magistrate and a Professor, is the Professors concentrate on their own department while the Magistrate works on the entire Shadow Academy as a whole. The Shadow Academy, is structured differently than its predecessor on Lyspair Whereas the old Academy was a spire in each of its four corners, the modern campus is comprised of several pyramid-shaped buildings arrayed around a central spire by a series of walkways and skyways. The various facilities afforded to professors and students allow the student body distraction-free learning and many aids to furthering one’s education. The Dark Brotherhood Fundamentals - The courses within this department focus on the common knowledge necessary to enjoy the Dark Brotherhood to the fullest, and are therefore recommended for all new (and old!) members. The Department of Leadership, Law, and Communication - The courses in this department will focus on the skills necessary to succeed as a leader in the Dark Brotherhood as well as introducing members to the Dark Covenant. It also contains courses on the various methods of communication that the DB uses. The Department of Lore - The courses in this department will focus on the lore and history of not only the Dark Brotherhood but also the Star Wars universe as a whole. The Department of Gaming and Combat - The courses in this department will focus on the various gaming aspects of the Dark Brotherhood. The Department of Writing - The courses in this department will introduce you to all aspects of writing within the Dark Brotherhood's Fiction Society and covers the Antei Combat Center, Fiction, Run-Ons, and more! 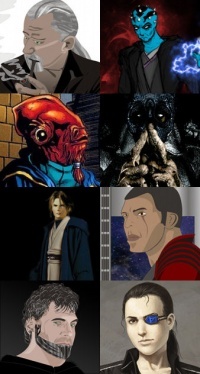 The Department of Legends - The courses in the Department of Legends contain Star Wars and Dark Jedi Brotherhood lore that is no longer considered "canon." These courses award academic credit and may count towards degree progress, but should not be relied upon for accurate, modern information. Enjoy a glimpse of the past. Some departments have been closed throughout the history of the Academy for a variety of reasons, usually because the courses are shut down or merged into larger departments. The Department of Philosophy focused on what Krath like best, knowledge. These courses were about Force Philosophy, as well as different cults and methods of alchemy. The Department of Coding Practices was one of the smaller departments in the Shadow Academy where the two courses offered were HTML Basics and HTML Advanced. The Department of General Studies was a department full of different kind of courses, however it was split into two new departments: the Department of Leadership Studies and the Department of Communications. The Department of Core Studies was folded into Brotherhood Fundamentals. The Department of Combat Studies was rolled into the Department of Gaming and Combat. The Department of Leadership and the Department of Law were rolled into the Department of Leadership, Law and Communication. The Department of History and the Department of Flight were folded into the Department of Lore. "The teacher should learn as much as his student." Stefan Ronin - Ronin was the Grand Admiral and leader of the Emperor’s Hammer. In a twist of irony, Ronin would eventually try to stop the Brotherhood, including the Shadow Academy, from breaking their ties with his organization. Black Hawk - Little is known about this Headmaster as records of his existence were purged by Grand Admiral Ronin. It is known that he also served as Herald and Dean of the Imperial Weapons and Tactics School (IWATS). Kumba - Little is known about this enigmatic figure, but he garnered a reputation as an excellent Headmaster. He is one of the few members in Brotherhood history to reach the esteemed rank of Dark Prophet and he was last seen just before the Exodus. It is believed that he merely went his own way during that time. Shups - Shups was known for emphasizing quality in his grading, rather than simply passing people for their effort alone. J'Lek Arcanos - J’lek cut back on some Shadow Academy requirements, notably by dropping required courses that were not material to a student’s chosen order. Mejas Doto - Mejas introduced several new courses to the Academy, as well as updated the antiquated archival system. He was forced from office by Astatine, resulting in a duel that almost ended both men’s careers as well as their lives. Troutrooper - Like Mejas, TT introduced several new courses to the Academy. 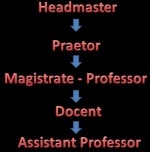 Mage - Mage is the only known Obelisk to hold the position of Headmaster, and introduced the first courses outside of the phase training program. Acxodim Pyralis - Most famous for his role as one of the Seven, Pyralis also introduced new courses, renamed the course teachers, and rebuilt the Society of Envoys to serve the Shadow Academy. Kaiann Yetaru Entar - Kaiann continued the trend of introducing new courses and built upon what Pyralis had begun. Kaiann also conceptualized the idea of Dark Side Degrees. Spears - Spears oversaw a good deal of the reconstruction of the Shadow Academy on Lyspair, as well as expanded course offerings and introduced the Dark Side Degrees system to the Brotherhood. Anshar Kahn Tarentae - Anshar saw to the evacuation of students from Lyspair during the alien Incursion and the invasion of Antei. His successful transition of the Academy to a mobile location - a flagship - resulted in its survival. Aabsdu di Plagia Dupar - Instrumental in the recovery of the Academy's home moon, Aabsdu reformed the teaching system of the academy to allow members to serve as Professors and Docents, rather than Eclectic Pedagogues. This allowed departments to provide more adequate knowledge and instruction for new apprentices. Taigikori Aybara Dupar - Picking up where Aabsdu left off, Taigikori continued strengthening the Shadow Academy as a place of dark power and wisdom. He introduced several new courses and developed a brand new department entirely focused on combat tactics and studies. He is responsible for the creation of the Shadow Academy Society. Ronovi Tavisaen - Ronovi, as the first female Headmaster, attempted to maintain the Academy model with modifications to departments, easier administrative access to creating and editing content, the creation of two debate and refutation courses, and the debut of the Shadow Academy Debate League. She was instrumental in preserving the Academy during Horizons. Solari - The first Jedi to run the Academy, Solari saw the formation of a Hall dedicated to the Journeymen of the Brotherhood. He also implemented the Shadow Academy Society. This page was last modified on 31 October 2018, at 19:58.